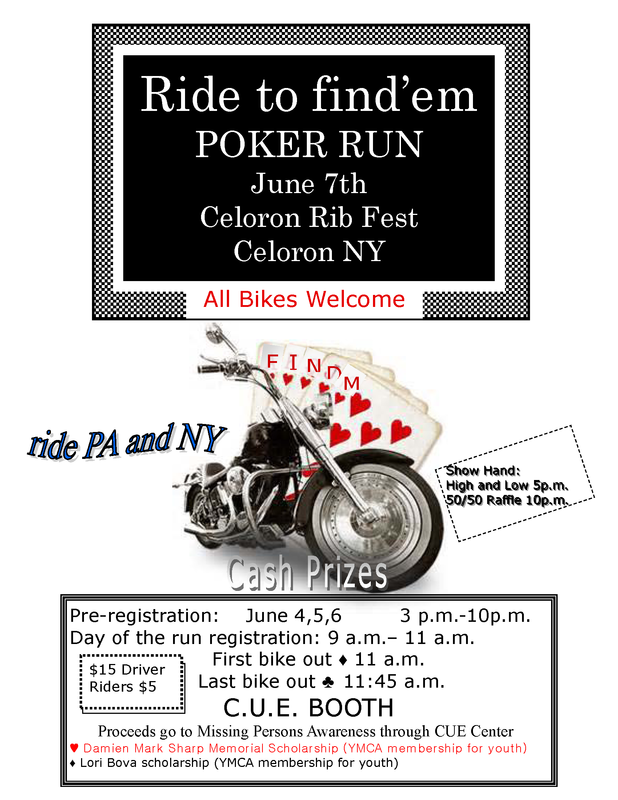 Here is another version of the flyer (85 mile bike run route details included). 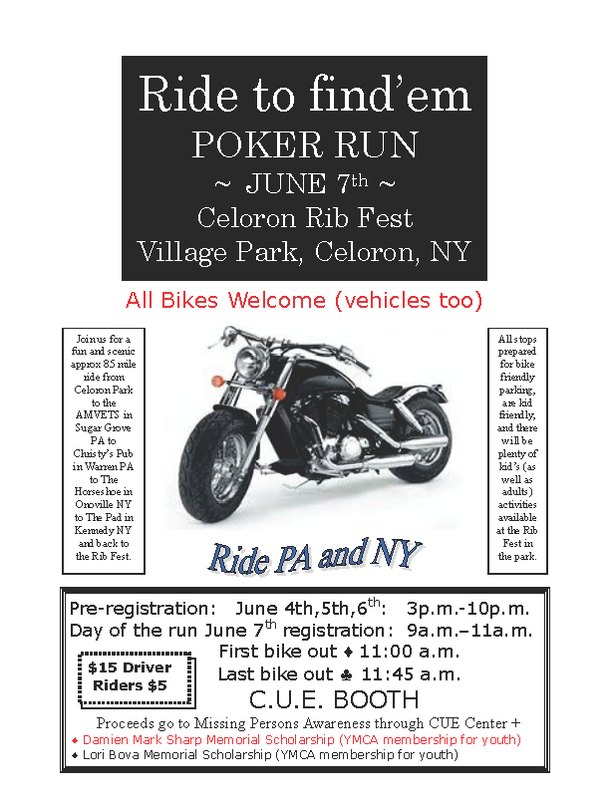 (Current flyer )MISSING poster 2013 time progression with C.U.E. Join us for our upcoming national conference for missing persons and all who work in the arena from advocating, volunteering, investigation, search and rescue and the identification process of those who are lost. This event is open to all who support the mission of finding a resolution for families who have suffered a missing loved one and are or have been a victim of crime. Please share this information to anyone in this line of advocacy or missing person work, family of a missing person or homicide victim. 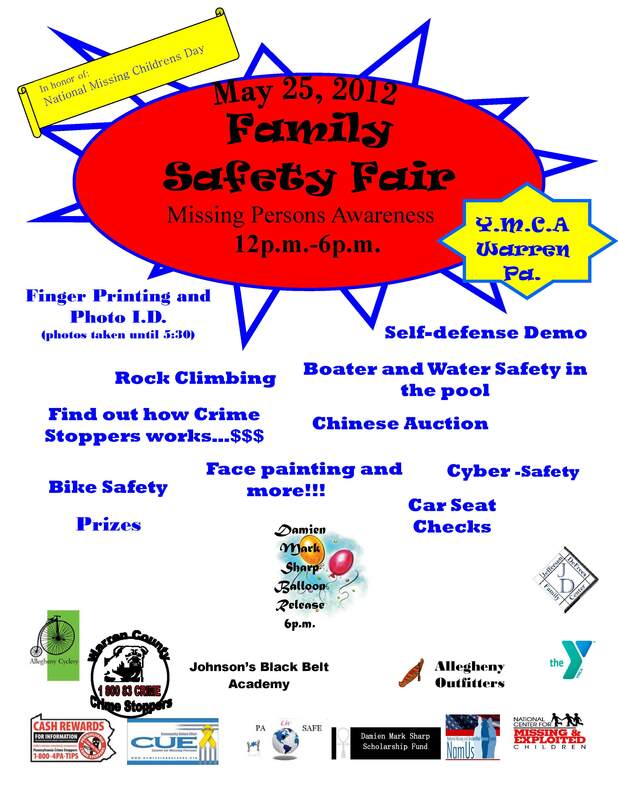 Updated (recap/scholarship donation)- May 25th FAMILY SAFETY FAIR-YMCA-Warren, PA 12-6pm; In honor of National Missing Children’s Day and Damien Mark Sharp, Missing 10 years. The 8th Annual National Missing Persons Conference March 2012 Wilmington, NC / also, new series called “NY Missing”. Join us for our upcoming national conference for missing persons and all who work in the arena from advocating, volunteerism, investigation, search and rescue and identification process of those who are lost. This event is open to all who support the mission of finding a resolution for families who have suffered a missing loved one and been left a victim of crime. Scars, Marks Tattoos:Approx 5 inch scar on left shin area that required stitches; Raspberry birth mark between shoulder blades; small round scar in occipital area that required staples. Clothing:Clothing – Red shorts, black hooded sweatshirt, sneakers. Nieko was last seen by family on 09/30/2011 in the company of a friend as a passenger in a GMC Canyon.Person last seen with is now deceased. Last telephone contact w/family was 10/01/2011. Nieko has not been seen or heard from since. If you have any information on this case please contact CUE Center For Missing Persons at (910) 343-1131 24 hour tip line (910) 232-1687. 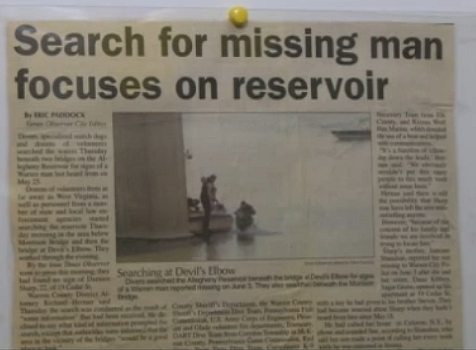 All information submitted to CUE Center For Missing Persons is confidential. Damien featured and family attends at CUE 2011 Conference. WILMINGTON — Hundreds of families and friends from across the country with missing loved ones gathered in Wilmington for a weekend of sharing, understanding and exploring. 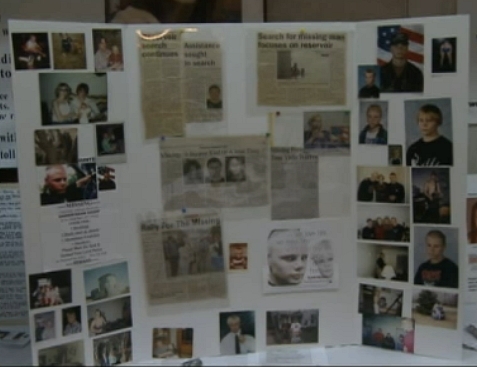 The families gathered as part of the National CUE Center for Missing Person’s 7th Annual Missing Person’s Conference. 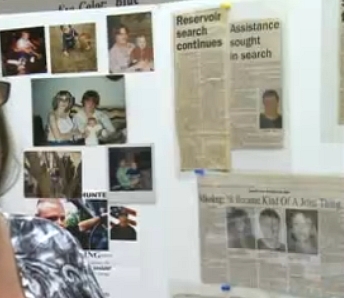 Katie Towner has been searching for her cousin, Brian Sullivan, since 2007 when he disappeared from Rochester, New York. 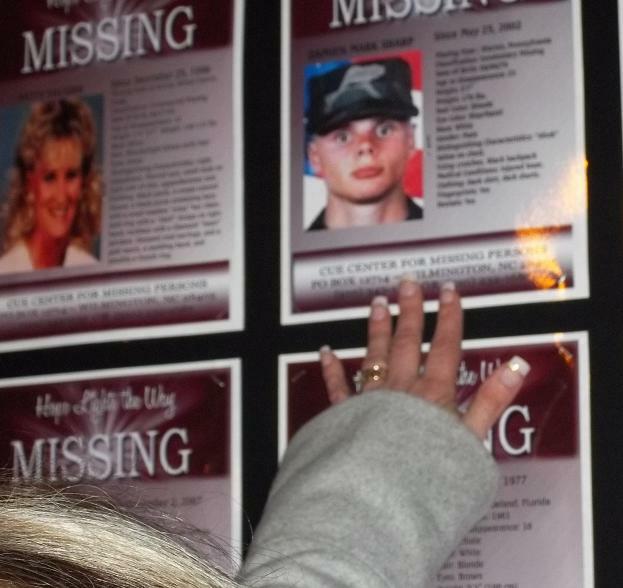 This year is Towner’s first time attending the missing persons conference. Over the weekend, Towner met over 200 people from 23 states who are also searching for a missing loved one and understand what she is going through. The Cue Center is located in Wilmington, but serves as an advocate for families across the country. The conference gives everyone a chance to gather together in one place. The theme of the conference was ‘Hope Lights the Way’ and gave families new approaches to finding out what happened to their loved one. “We see a lot of bonding and relationships occurring for those who feel like they’re lost out their,” said CUE Center Founder Monica Caison. Caison said many people attending the conference walk away with a new sense of hope. “They’re meeting other victims that have found their loved ones, so our families are more encouraged that hey this does happen,” said Caison. The non-profit organization has helped more than 9,000 families. If you have any information about any missing persons case, please call the CUE Center for missing persons at 910 343-1131. To the mournful, love-filled words of Leonard Cohen’s “Hallelujah” and candles lighting up the night, a large gathering at Riverfront Park honored homicide victims who were once missing persons. 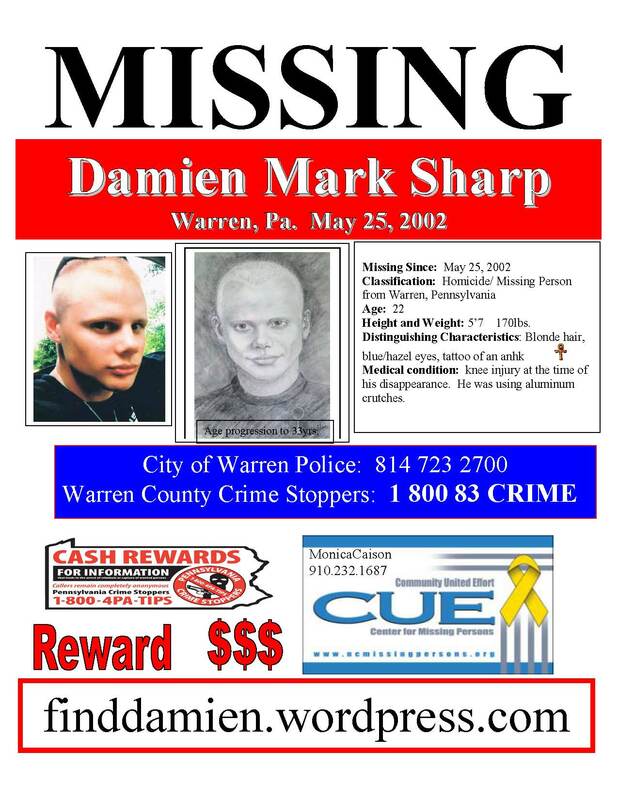 Warren County Crime Stoppers doesn’t usually get involved in missing persons cases, but in the case of Damien Sharp, the organization is making an exception. 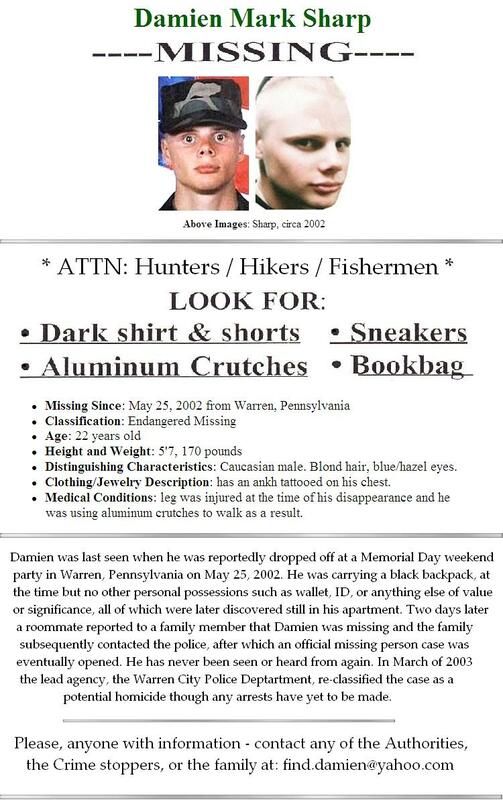 Since Sharp was last seen in May of 2002, many local and regional organizations have contributed to the effort of finding him. Crime Stoppers is joining that list and making the reward available the largest it has ever offered. Sharp’s mother said on Thursday that she was pleased and surprised by Crime Stoppers’ announcement. Police are investigating Sharp’s case as a missing person and a possible homicide. That it is possible that no crime was committed makes Sharp’s case an unusual one for Crime Stoppers. The board described resolving the case as “paramount,” according to Carnovale. “We feel that if we make it appealing to some individual who knows the whereabouts of where he is, dead or alive, this might entice someone to come forward,” Carnovale said. 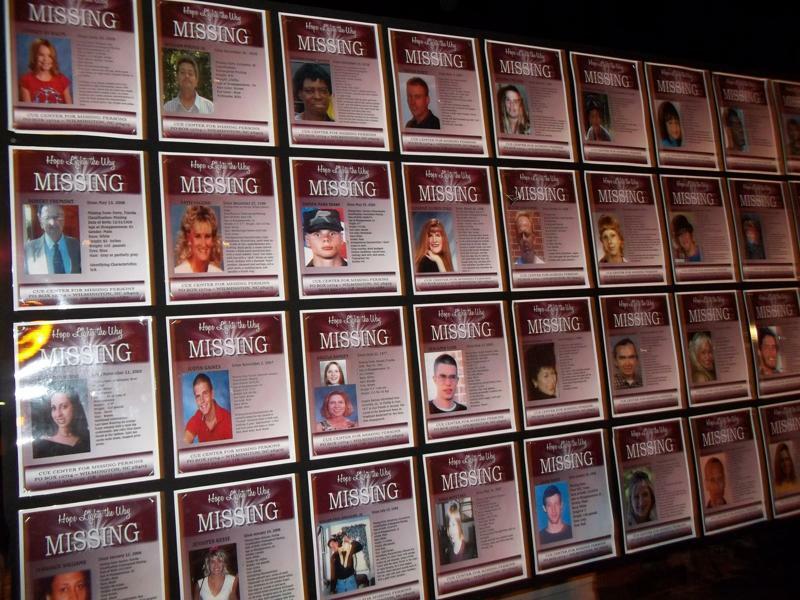 In addition to Damien, the CUE center lists those missing throughout the country. 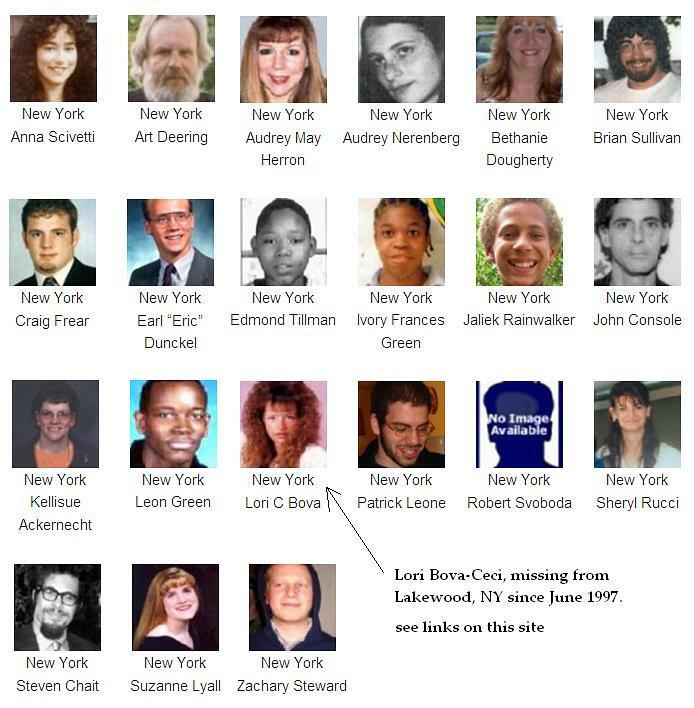 Damien is missing from Warren, PA which is also very near the NY border and in the list below of those from NY you will see Lori Bova (whose family are dear friends to us), Lakewood, NY and Warren, PA are coincidently and ironically only 20 minutes away from each other. (see here on our site for links for info about Lori). It was especially wonderful to have been able to be there on behalf of Lori’s mother who passed away last year, and it was also wonderful to see and meet so many other families from our area at CUE’s National conference in Wilmington. The following missing persons from other states are currently listed; anyone with information concerning a missing person please contact our center, you do not have to reveal your identity. You must have your case registered to be featured on this site, click on “file a report” to learn more. I agree and support Act 4162 by way of this petition presented before me, by the CUE Center for Missing Persons and Milton Nerenberg, the father of Audrey Nerenberg; who is still missing. I agree that this law would aid in the search and recovery of missing adult person(s) that have been certified with a mental capacity of a child, to include children under the age of 18 years old. I understand this law would offer national organizations, media outlets and law enforcement alike to service these individuals as children and in some circumstances would qualify for the Amber Alert. I understand this petition will be used for it’s intended purpose only. In addition here is a tool to contact your government officials with. Just follow these instructions and you’ll have an automated way to urge your federal and state representives to support these measures. Click to go to the site; Enter zip code click Go; Scroll down to where it says – “compose your own message to Federal or State officials”, click one of them, and then write your letter. "My gratitude, a heartwarmth thanks, for anybody that is out there looking, that has helped," said Damien's mother, "Even in the smallest way, is appreciated by our family." Over the years The FBI, The Warren County Sheriff's Dept., Pennsylvania State Police, Warren City Police Dept., Warren County District Attorney's office, U.S. Forest Service, Chautauqua County Sheriff's Office, Glade Volunteer Fire Department, the Salvation Army, and various K-9 teams, Dive teams, and countless other search volunteers, as well as support advocates such as those with the CUE organization have done something to help. Where it's impossible to mention everyone, even if not specifically mentioned here, you are not forgotten in your efforts, and no amount of thanks could ever suffice. Never the less, a heartfelt thank you to all. Raise money for CUE Community United Effort – just by searching the web and shopping online at no cost to you! Every missing person is loved by someone and deserves help to be located. Annual NYS Missing Persons Day; Support; National Remorial for Missing Persons; other Legislative initiaves. Support legislation for the missing by learning about the Silver Alert Act. Let's Bring Them Home is currently working on several national programs and are looking for volunteers, program partners, and other support. Please sign the petition to support Kristen's Act Reauthorization and let your representatives know you care about this issue. Here's a tool you can use to contact your legislators. Click map to go to the site, Enter zip code click go, Scroll down to where it says "compose your own message to Federal or State officials", click one of them, and then write your letter. Prior to Damien's return to Warren, he served in the US Army 10th Mountain Division out of Fort Drum NY, and had done a tour overseas in Bosnia Kosovo. He will always be proudly remembered for his honorable service to our nation.